Nottingham Trent University (NTU) has launched its engagement programme ‘Green Rewards’, encouraging its 4,000 staff across four campuses to take part in activities that boost sustainability and wellbeing at the University. NTU is one of the world’s most sustainable universities, ranked 5th globally in the UI GreenMetric World University Rankings and third in the UK by the People and Planet University League. ‘Green Rewards’, the new programme provided by specialist engagement experts, Jump, helps to embed this focus on sustainability across the entire workforce at NTU. Through an online platform employees are able to track their positive actions across six key themes; My Carbon Footprint, My Resources, My Travel, My Food & Drink, My Community and My Health & Wellbeing. Specific activities such as calculating your carbon footprint, making a plastic pledge and volunteering are rewarded through the programme. Other activities such as taking lunchtime walks, regular exercise and mindfulness acknowledge the importance of wellbeing to the University. Each activity theme aligns with one of the United Nations’ Sustainability Development Goals (SDG’s), allowing participants to understand their positive impact on a global scale as well as at an individual and University level. Online leader boards display the top performers, with the two top individuals winning a £20 voucher every month. The leader boards also display the top performing teams across the University, with a £200 charity donation prize awarded every six months to the winning team. The launch of Green Rewards reflects NTU’s ongoing commitment to reducing their organisational environmental impact, as well as a wider trend across the city. 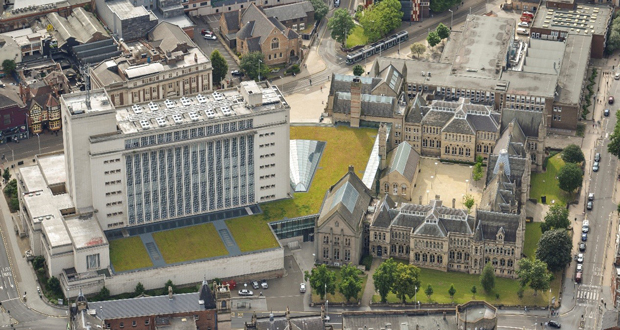 Nottingham City Council’s recent target of becoming a ‘net-zero carbon’ city by 2028 relies partly on a shift in behaviour towards more sustainable practices. NTU is the 11th University to launch a programme with Jump, alongside clients in the private and public sector.